How to Track and Analyse Hashtags on Twitter? Who could’ve predicted that a modest pound sign will make such a career on social media? Nowadays, it’s hard to imagine Twitter without hashtags. They help to spread your content, reach brand new audiences and help measure the performance of marketing campaigns. Hashtags on Twitter help improve the reach of your posts and deliver your message to users with specific interests. But to enjoy all the perks of hashtags on Twitter, you need to track and analyse hashtag performance on this social media platform. That’s not a complicated task, provided you have the right set of tools and know which metrics to analyse. Hopefully, this blog post will shed some light on Twitter hashtag analytics! who is the most influential Twitter user applying your hashtag to their tweets. Tracking and analysing your hashtags on Twitter should be an essential part of your Twitter marketing strategy. Twitter hashtags analytics will help your Twitter marketing strategy generate new leads, and increase sales. Hashtags on Twitter play a similar role as on any other platform. They help improve reach among users interested in specific topics and get your message to new audiences. collect general information about your audience. Using hashtags allows users to follow content they are most interested in – be it tweets from a concert, theme, sporting event or anything else. With more and more content produced every day, it’s hard to spot the topics your audience might find interesting. Hashtags will help them filter the material and see the things they want to interact with. Let’s take a deeper look at the Twitter hashtag analytics. I’ll analyse Twitter hashtags based on Brand24 dashboard, top social media monitoring tool (at least, according to Buffer). 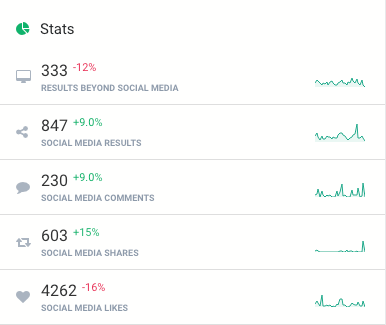 When it comes to social media monitoring and hashtag analytics, you have to start with creating your project. 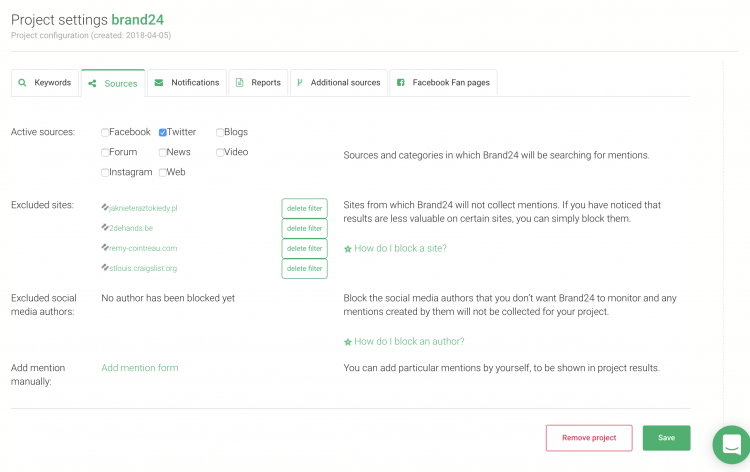 In the project creation wizard, enter the keywords you would like to monitor on Twitter. Since we would like to focus on analysing hashtag on Twitter, let’s use the one you use there. I connected the project to my Slack channel, so every time there’s a new Twitter mention, I get an immediate notification. But we also offer an email notification and an app, both for Android and iOS. I know who is talking about Brand24 which channel he or she is using and I can react right away. I gather the mentions from the whole Internet but if you want to narrow the search from the very beginning, take a look at the Project Settings tab. You can choose the social media channel you want to focus on and only see those mentions in the Mentions tab. The volume of mentions is a diagram which shows how many times your keyword was used during a specified time. That might seem like not much, but is, in fact, one of the essential metrics. The volume of mentions will show you all the spikes in the number of mentions which help identify the seasons when your product is most wanted. The volume of mentions analysis also shows social media reach and the total number of interactions. Based on this analysis you will know whether your campaign reached a certain amount of people and whether your content was interesting enough to spark some engagement. Engagement on Twitter is expressed in likes, retweets, and comments. The volume of mentions analytics won’t tell you the whole story. To really understand what people are saying about your brand you need to combine the volume with hashtag sentiment analysis. Hashtag sentiment analysis will tell you whether people are talking about your brand in a positive or negative way. Analysing the sentiment around your Twitter hashtags will allow you to determine whether your campaign has a positive or negative impact. A high volume of mentions with negative sentiment means your brand is evoking some bad feelings and you have to analyse the matter in greater detail. Social media reach is an estimated number of Twitter users (or any other social media channel, if you’re monitoring mentions from multiple platforms) that might have stumble upon your tweet. 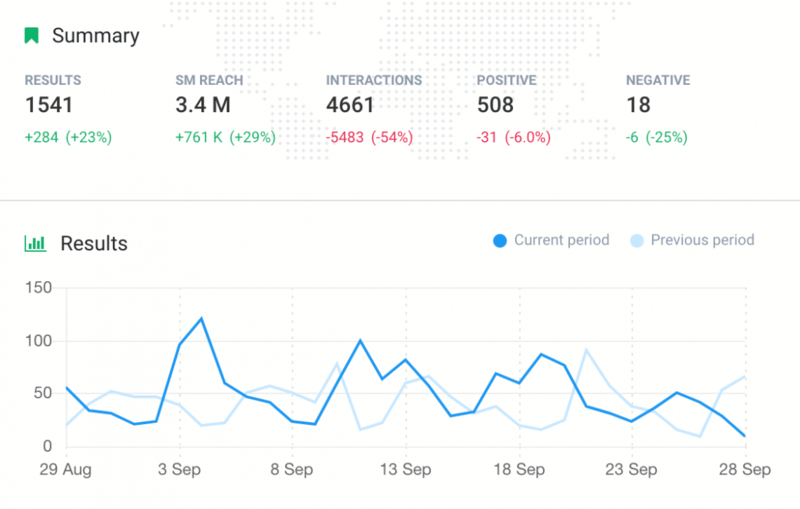 Social media reach shows how your hashtag is spreading and what audience it reaches. It’s a very useful piece of information. You’ve probably already built your buyers persona, now it’s the time to confront your research with reality. You might find a brand new audience for your product which is excellent news because it means you’ll be able to convert more users and increase your revenue. But that can mean something negative as well. You can spread your message to the wrong audience. In this case, you need to change the message or change the social media channel. Maybe there’s no one interested in what you’re offering on Twitter and your target customers hang out on Instagram instead? I will argue that engagement is one of the most important metrics when it comes to Twitter analytics. Engagement rates tell you how many users interact with your content. If your posts are interesting, attractive, and relevant, your audience will appreciate it and interact with them. Influencer marketing is an amazingly effective way of promoting your business. Customers tend to trust influencers’ messages much more than traditional advertising. The key to success is to find the right influencers to cooperate with. The most persuasive influencers are already in your network. They are either already talking about your product or talking extensively about your specific niche. 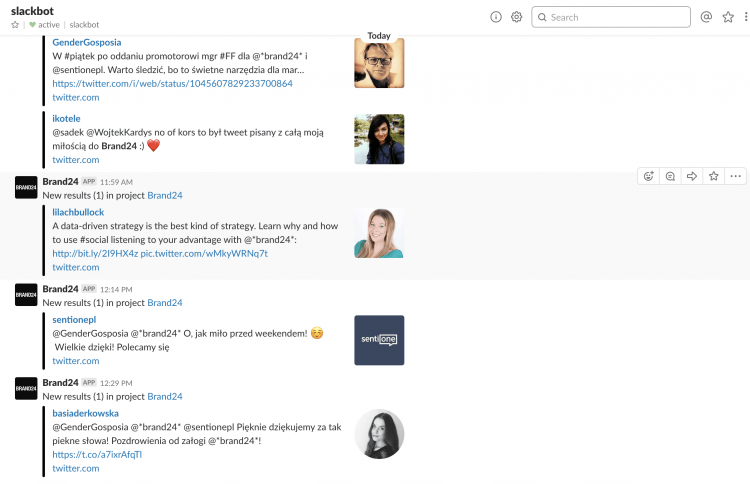 To find Twitter influencers with the highest share of voice, go to Brand24’s Analysis tab. 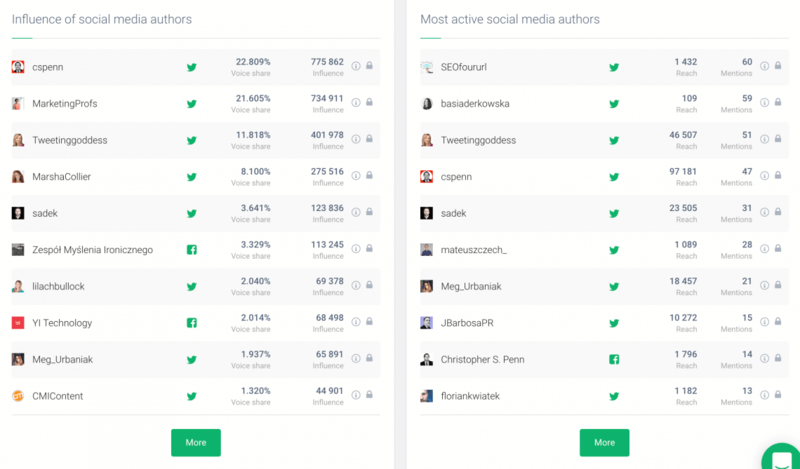 Brand24’s algorithm shows two metrics you might find interesting: influence of social media authors and most active social media authors. The influence of social media authors will also indicate their share of voice (the amount of discussion on the Internet generated by these social media users) and their influence (how many people were possibly affected by their message). You can use up to 30 hashtags on Instagram which gives you plenty of opportunities to use branded hashtags and get your content exposed to the right audience. You only have 280 characters for each tweet which means you have to curate your content carefully. That’s why choosing the right Twitter hashtags is essential. Identifying the right hashtags will help you boost your message and reach users who reflect your ideal marketing personas. Always-on hashtags can be your branded hashtags you use with every post. You should attach the first type of hashtags to all of your Twitter posts. It can be the name of your company or a slogan, like Nike’s “Just Do It”. Campaign-specific hashtags will help you analyse the reach of your social media campaign. Campaign specific hashtags have a much shorter lifespan as they are attached only to one marketing campaign. Analysing campaign specific hashtags allow you to take a look at your campaign performance. Twitter trending hashtags will help you boost your brand awareness. These are simply hashtags associated with your specific business niche that other Twitter users incorporate into their tweets. We established how crucial it is to add and analyse the right hashtags to your Twitter message. The question remains – how do you spot the hashtags that will be relevant to your audience and will boost the visibility of your posts? So, where’s the goldmine of knowledge when it comes to finding trending hashtags on Twitter? 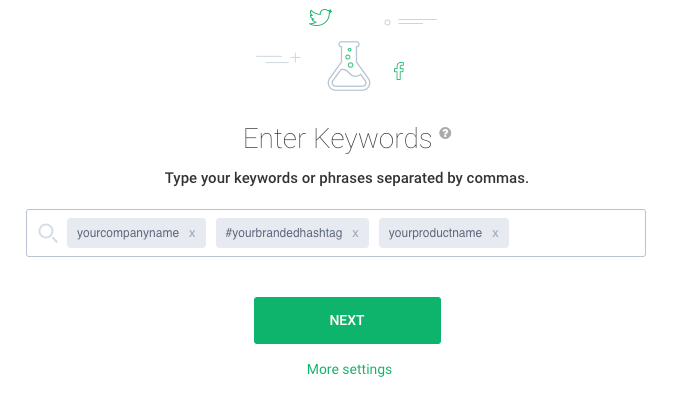 Based on the data we collect, we generate a list of 100 trending hashtags – hashtags that are relevant to your industry. 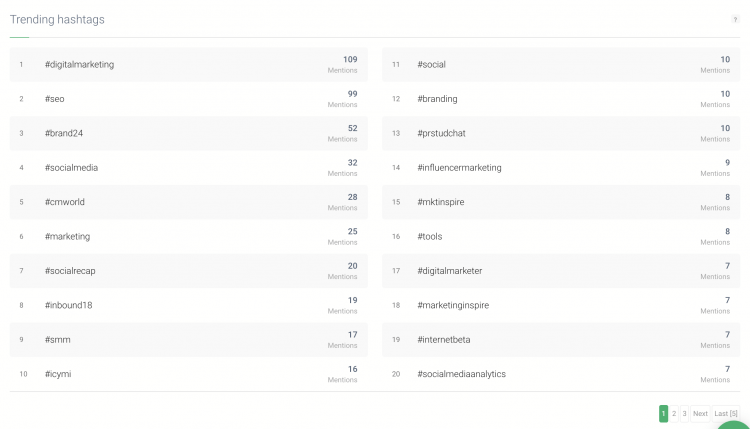 We added hashtag analytics metrics so you can see how many mentions each hashtag generated. Social media listening tools, in general, don’t collect historical data, only the mentions that appear from the moment you create a project. If you have a project for a more extended period, you’ll be able to analyse historical data from previous months. All you have to do is change the date range in the upper right corner. This functionality will help you spot the seasonal changes in trending hashtags and adjust your hashtag Twitter campaigns accordingly. Unfortunately, there is no easy recipe for success. You have to find a branded hashtag that will be associated with your brand. There are hashtags clearly associated with certain brands, like #ShareACoke or #JustDoIt. But if you don’t have such a great copy simply use the name of your brand. It’s hard to come up with such an evergreen slogan. I don’t have a magic wand to help you with that, but I have some pieces of advice that might help you with this task. Use words that run into each other. When you put multiple words together, they can change their meaning. Susan Boyle’s album release party is a classic example (the hashtag the PR agency went for was #susanalbumparty). Twitter hashtags can help you reach an audience who is actively talking about things relevant to your brand. Participating in relevant conversations and sharing your experiences and thoughts will help you establish your brand as an industry leader. Twitter hashtags can also assist your marketing efforts. That’s why it’s important to find the right hashtags and monitor their performance online. Analysing Twitter hashtags will help you reach the right audience which will ultimately increase sales. So, are you ready to give Brand24 and Twitter hashtags analytics a spin? Are you analysing the hashtag performance on Twitter? Do you have any valuable insights? Let’s talk! You can find us on Twitter, Instagram, Facebook, or LinkedIn!